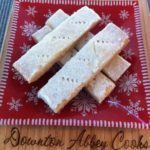 Shortbread is an easy holiday table treat If you don’t have your own family recipe to fall back on, here is a great one inspired by Tea at Fortnum & Mason. Rice flour is the secret ingredient which gives the shortbread a nice crisp texture. Take care not to overwork the dough, otherwise the butter will become greasy and will give an oily finish to the biscuit. Otherwise this is a never fail recipe.